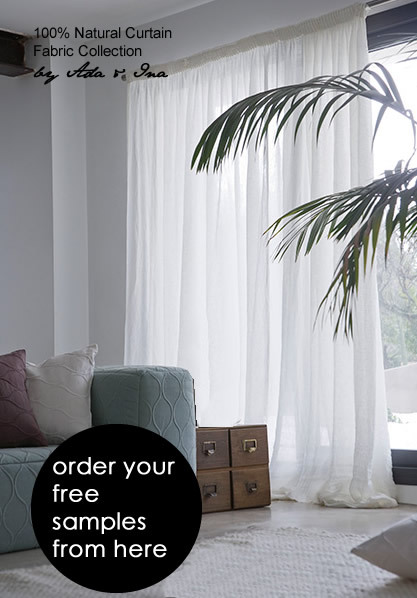 Ada & Ina semi-transparent designer voiles make a living room, sitting room or dining room look light and chic. Voile is a closely woven, thin fabric which looks silky and is smooth to the touch. At Ada & Ina we offer natural voile curtains made from 100% cotton and 100% linen, which are excellent for soft furnishing and sheer curtains. Some voiles designs are glossy and others have more natural, cotton like appearance, and are 100% natural. Browse our collection of natural fabrics. Voiles are versatile curtains: you can add voile curtains to your current curtains in an easy, affordable design feature. Voile curtains will also look great when hung by themselves, because they will let in light and give the room an airy, bright look. They function similarly to net curtains, with the difference that voiles come in a wide range of different colours and patterns, while net curtains are usually only available in white. Check out our discount designer voiles - an easy, chic feature in your home decor. At Ada & Ina we offer a range of voiles and voile curtains in patterns and colours, both ready-made and made-to-measure curtains. Order fabric samples today!